Capturing the unique New Mexico heritage and the spirit of the Southwest, the Hilton Santa Fe Historic Plaza is housed in a landmark 300-year-old hacienda, ideally situated just two blocks from the notable Santa Fe Plaza. Originally built in 1625, this historic estate has a long tradition of warm hospitality, beginning centuries ago, as the private residence of Padre Ramon Ortiz and his family. Today, combining the elegance of a bygone era with sophisticated conveniences, the heritage-rich hotel features 158 thoughtfully-appointed guestrooms and suites, over 7,000 sq ft of meeting and event space, casual and refined dining experiences, and proximity to Santa Fe's most significant attractions, including the Georgia O’Keeffe Museum, Museum Hill, and Loretto Chapel. 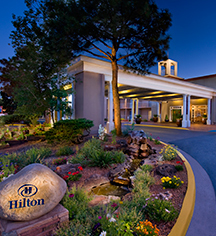 Hilton Santa Fe Historic Plaza, a member of Historic Hotels Worldwide since 2015, dates back to 1625. 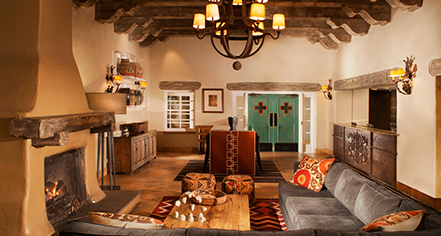 Housed in a landmark 300-year-old hacienda, three luxury casitas were built within the adobe walls of the original coach house of the estate. Early Check-In/Late Check-Out: Early Departure Fee: $50.00 A fee will be charged for any early departures. Late Check-Out Fee: $50.00 A fee will be charged for any departures after posted check out time. Parking: Self-parking: $19.00 (Parking Lot.) Valet parking: Not Available. Secured: Available. Covered: Not Available. In/Out Privileges: Available. Other Parking Information: Dining only: free for self-park. Payment: All forms of payment are accepted. Payment is required at time of booking. Visa, MasterCard, Amex, Diners Club, China Union Pay, Carte Blanche, Air Canada, and Discover are accepted. Pet Policy: Service animals allowed: Yes. Pets allowed: Yes. Deposit: $75.00 (Non-Refundable). Maximum Weight: 60 lbs. Maximum Size: Large. Other Pet Services: Pet rooms are located on the 1st floor. Capturing the unique New Mexico heritage and the spirit of the Southwest, the Hilton Santa Fe Historic Plaza is housed in a landmark 300-year-old hacienda, ideally situated just two blocks from the notable Santa Fe Plaza. Learn more about the History of Hilton Santa Fe Historic Plaza .